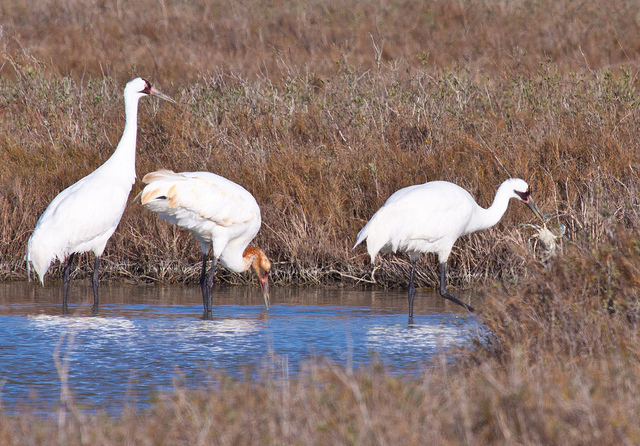 During January, migratory cranes are on their wintering grounds. Feeding is their main activity. They must build up fat reserves to fuel the long flight back to the summer nesting grounds. Whooper chicks are fed most of the winter by their parents. Learning how to eat blue crabs is important for juvenile cranes during their first winter in Texas or Florida. Blue crabs are not so easy to eat! When an adult catches a blue crab, Junior runs over and begs for an easy meal. Small crabs are swallowed whole. With a big crab, the adult usually carries it to the edge of a pond and pulverizes it on before feeding pieces to the youngster. An adult crane can eat up to 80 blue crabs in a day!